I was going to give these topics a rest, but something came up. My lack of belief in the supernatural is pretty much complete - I have never seen any reason to attribute a supernatural cause to phenomena. I suppose I rule out supernatural explanations because once you let one in, where do you stop? I look at an event I do not understand and go immediately to natural causes. Even if I can't figure it out, I still would assume it had a natural explanation. I'm worried that if someone started attributing causes to supernatural events, they would skip over the whole 'natural cause' thing and go straight for the supernatural, because technically everything is potentially explainable by an omnipotent being, no? For various reasons, I believe that Zach is much younger than me; I am old enough to be his — professor. Now I will attempt to act like one. Realize that you have a great deal to learn about Life, the Universe and Everything; the more we learn, the more we realize that there is still more to learn. Other people can know and understand things that we do not know. This bit of wisdom should help us become more patient and willing to listen. Define your terms. (Later on, you'll read how I qualify my "belief in the supernatural".) You can fight over misunderstandings as well as agree on things that you did not know about; I argued with a guy for two days and then found out that we were in agreement all along, the problem was just in how we understood certain words! Embarrassing, and I've remembered that for incident for (mumbles) years. Frame your questions without your bias showing. While we all have our biases, we do not need to act like we are tolerating the ravings of a madman when we ask our questions. You may be surprised that said madman actually knows more than you thought. If you begin like a flamethrower, do not cry because you get flamed right back. When discussing things, pride is your enemy. You may not only have to eat your words, but possibly a bad attitude (or slink off into the darkness like some people I have encountered). Just be ready to listen. You can develop patience and diplomacy if nothing else. Remember that people are different, and not everyone knows the same things that you know. Besides, you may find yourself actually liking someone despite your philosophical differences. It's happened to me, and it can be a bit unnerving sometimes. Don't quibble about small stuff. I've seen people that were all too happy to find some excuse to vilify someone and missed the point that was being made because they majored on minors, slip of the tongue, misspeaking, typo pouncing &c.
That's enough, I want to get to what he actually said before the lot of you doze off. Zach has admitted to having a materialistic bias. That is excellent to know and admit to having a bias, because so many people think that they are totally neutral and make their decisions based strictly on the facts. The problem with a bias (or presupposition) is that you have to be careful that you do not preclude other possibilities, especially with a naturalistic bias. If you become adamant that there is no other explanation outside of what can be experienced or measured, you are being illogical. Why? Because you are assuming a kind of God-like role of knowledge, and you are declaring an absolute negative. I like to point out to people that just because something is outside your realm of knowledge, experience or the senses does not mean that something does not exist. For example, I have never been to China, but I know it is there. I have seen pictures, heard the testimony of Tibetans who escaped from China into the United States, read history reports and so on. It's a matter of faith. Many atheists rail against the concept, but yes, they do have faith: Faith in the philosophies of science, faith in evolution, faith in the Big Bang, faith in themselves. When it comes to the supernatural, what then? If a naturalistic approach is an unmovable law for someone, then they have to dismiss evidence that does not fit into their preconceptions. By doing so, they are rejecting possible explanations out of hand. When people are locked into their preconceptions, they often get very illogical: "Creationists are not scientists because they believe in Creation" (circular reasoning), or, "Creationists are religious fanatics that are not scientists because Dawkins said so" (erroneous appeal to authority). Those statements are both wrong because Creationists and Intelligent Design proponents are actual scientists who have degrees from actual accredited universities. Just because they believe in the "wrong things" according to this bias does not negate their credentials. Zach's approach of going to the natural explanation is, in my view, the proper way to go. Years ago, I learned something about UFOs: Look for the rational, normal explanation first before going after the supernatural; try to debunk an encounter. Where did I learn that? From believers in UFOs! Whether it's God, UFOs, ghosts or what have you (see "Ghost Hunters" on this), if you run screaming into the street with "proof", you look like a fool when the claim is soundly debunked. (Note that I said "soundly debunked". That is a far cry from being unconvinced by the evidence, or disbelieving it because it does not fit into preconceptions.) Then you can build up a reputation for being cautious and thorough instead of being gullible. I believe this is where your question about supernatural explanations, "once you let one in, where do you stop?" applies. 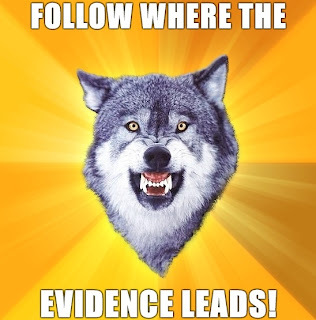 If people are willing to examine the evidence and not blame or credit the supernatural at the drop of a hat, "false positives" can be avoided. As you well know, I believe in the supernatural. But let's be careful, shall we? That word covers a great deal of ground, so it has to be limited. Right now, I am limiting my use of that word to people and events in the Bible. You have seen how I reject evolution. I have seen strong biases proclaiming its truth but denying its errors. My conclusions led me to reject evolution on scientific grounds. Funny, too, because I used to be a "theistic evolutionist", believing that God used evolution to create the world. I think I'm hesitant to come out and say that I have to accept belief in God as an explanation. "Why do you feel that way, Cowboy Bob?" Because I have reached my conclusions many years ago, and they are constantly reinforced. For those reasons, it is difficult for me to lay out my reasons for going to the supernatural as an explanation and having you think that I am "jumping" over there. I suppose I want to say that belief in God (or, as many atheist accuse us of believing, "Goddidit") was not without serious thought. Now I have to get more personal and tell you my own story. I'll cut out as much superfluous matter as I can, this thing is long enough already. I was raised in a Christian home. My father was a United Methodist pastor, and that is one of the most liberal denominations that you can find. When I went to a Christian high school, my beliefs were challenged, because they were very conservative. Someone would make a statement of belief, and I would want to know, "Where did you get that?" I have long been skeptical, and needed "chapter and verse" to back things up, even before I received serious Bible teachings. Internal consistency. Get ten of your friends together and ask them about theological, philosophical and other controversial subjects, and see how much agreement you get. Compare that to the Bible, which was composed over thousands of years through different cultures, languages, occupations, rulers and so on, yet with uniformity. Rewrite: The Old Testament was written from about 1400 BC through 400 BC, and the New Testament was written from about 50 through 90 AD. Textual variations. You would think that texts that were, say, five hundred years older than other texts would be vastly different. Instead, there are startlingly few variations, comprised mostly of slight wording and writing differences, but nothing of substance. Abundance of translations. There are far more copies of all or parts of the New Testament than any other ancient book. If you doubt the Bible, you should also doubt the reliability of the writings of, say, Julius Caesar, since there are about one tenth of the copies of his works in comparison. The ring of truth. C.S. Lewis referred to the "ring of truth", because the Bible presents people with all of their flaws and failures. Tell me, if you were going to create a religion, would you have disciples denying their Lord, cowering in fear, disbelieving in his resurrection? Me, neither. Archaeology verifies it. Sure, people claimed to disprove parts of it. Guess what? The disproofs were disproved. Archaeological and historian heavyweights affirm the validity of the Bible. Whew, this is long. Hope you click the links and get more information when you have time. Another important reason for me to accept the existence of God and the resurrection of Jesus from the dead is the testimony of people who have had their lives radically changed. I was a fool and put God on the back burner for fifteen years, only recently coming back to my faith. I had sinned and broken God's moral law. How many times have I taken his name in vain (Exodus 20.7), lied (Exodus 20.16), stolen (even though it was small stuff, Exodus 20.15), lusted (committing adultery in my heart, Matt. 5.28), tried to reshape God to suit me (Exodus 20.3), I cannot say. But God knows that I mangled all of the commandments. And I know that Jesus died a horrible death on a cross to take my punishment (1 John 4.10). He arose from the dead (1 Cor. 15.3-8). Now I belong to him (Galatians 2.20). God does not make sense because he is God. How can the creation understand the Creator? He loves us, and we have broken his laws. How can we understand that? Jesus explained him, the Bible explains him. If we humble ourselves and stop trying to make God act in a manner that is pleasing to us (which includes the way he is supposed to manifest himself), he will come into our lives, save us from the punishment of our sins and give us new life (2 Cor. 5.17). He gave me something to live for, not to fight against. Well, I hope your answer was in there. If not, ask further questions. I won't make a grand essay of it next time. Thanks for writing. "It is true, that a little philosophy inclineth man’s mind to atheism, but depth in philosophy bringeth men's minds about to religion; for while the mind of man looketh upon second causes scattered, it may sometimes rest in them, and go no further; but when it beholdeth the chain of them confederate, and linked together, it must needs fly to Providence and Deity." I have to admit that I'm stumped about something. And I do not like writing an article of this nature, where I am responding to something said about me in the comments section of another Weblog. But I feel that I should. There was a comment about me at "Atheist Central", but I am reluctant to name the source. I'm thinking that he (?) may not want to be named outright, here. Well, if he (?) wants to leave a comment and claim it, then fine, I'll acknowledge it. 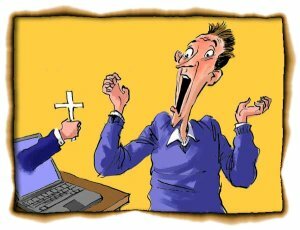 But he will not, since he said (among other hateful things), "Thankfully, my atheistic morality prevents me from visiting the blogs of hate-filled, angry, bigoted, and racist people such as yourself." (Racist? Where did that come from? Everyone annoys me equally.) It is indeed unfortunate the this craven little coward cannot back up his (?) accusations, preferring to live in a neurotic, self-created world. Atheistic morality? Uh, yeah, seen it in action, it's situational convenience, nothing more. The quote goes as follows, and I quote, "Stormbringer, for example, would rather see atheists burn in hell than show or tell them of God's love for them." Not only did this do nothing to advance an argument, but the paragraph to which it was attached was in reference to Hitler. Horrible use of logic, or even of writing itself; such an accusation deserved to be in a separate paragraph, with supporting sentences. In the comments section of Atheist Central, there are one or two Christians that I consider embarrassing. They remind me of a guy in a video clip who was waving a "Jesus (heart) You!" sign and dancing around on Hollywood Boulevard. I'm not into being a cheerleader, or inviting everyone over to sing "Kumbaya" and serve ice cream sandwiches. That's not God's love, that's sappiness. One guy in particular blows so much smoke, I'd be afraid of getting TB if he was nearby. This is the problem that I have with the aforementioned antagonist and to many other "new" atheists who claim to love "reason" and "science" is that they have their preconceptions and cannot be shaken by contrary evidence. In fact, contrary evidence is disallowed by default: If it is not offered by an atheist scientist, then it is not science and it is bad reasoning. Rubbish. As I have pointed out before, atheists are demanding proof for the existence of God, but refuse to look at apologetics links or other arguments that are offered because "I know what it's going to say, and it's dumb". Really scientific and logical, Poindexter. If one of the few intellectually honest and courageous (or curious) atheists wants to examine evidence for the existence of God, or for the validity of the Bible, I have apologetics links available near the top of the page, just below that introduction box thingie. Hopefully, you won't be like that coward and dismiss things out of hand just because you're afraid of being proven wrong. 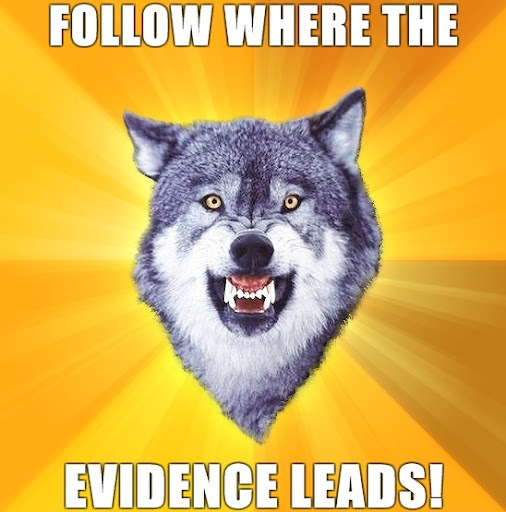 Follow where the evidence leads — I dare you. I try to get these people to think. When I catch them in errors of logic, naturally, I get excuses and the equivalent of a rude gesture to prove that they are my intellectual superiors simply because they said so and xtians are big dumb stupidheads. So they get offended because I show them flaws in their logic — that thing they claim to admire so much. The problem is, and perhaps they know this intuitively, that if they see cracks in their armor, then they may have to admit that there is more to reality than they originally thought. As for the charges that I do not show or tell of God's love — waitaminnit! Why should he (?) care? God, Hell and everything else do not exist in this worldview. Is it self pity, or just lashing out in hate? This guy (?) has problems. May 17 article, with a rock song about Hell. It doesn't have to end that way! I've lost count of the number of times I've advised people to dump the hate because it clouds reasoning ability. Too bad this intellectually dishonest coward will not see where he (?) is proven wrong. Note that this is a multi-purpose Weblog, not just for the entertainment and education of atheists. Also, it is not a "ministry", but I do have spiritual values that I insert in some of my articles. If you don't like them, read around them. If you care to browse, you'll see all sorts of fun things. And since it's multi-purpose, plus the fact that I'm very, very, very tired of banging my head against the brick wall of anti-theism, I'm going do deal with other things for a while. Buona sera. On the surface, it really baffles me that ("new") atheists are making total war with Christians and Theists. Why? What is the real reason (not just some nonsensical excuse you've conjured up so you can pretend that you have a valid cause)? Why put anti-Christian signs on buses, vandalize crosses at public war memorials, stashing 666 copies of failed DVD "The God who Wasn't There" in churches for Easter, protest the Ten Commandments in public — and protest the Sunday morning meeting of Answers in Genesis? Anyone watching from the outside will probably say, "What a bunch of jerks. If they're smarter than all the Christians, then why not just go on about their business, confident in their superiority?" Addendum: The follow-up to the protest is here. I have asked several times, without response, why they attack and troll Christians, but not easier targets like Mormons, UFO enthusiasts, New Agers, witches, Satanists, Muslims — well, the last two may very well track them down and hurt them, so I'll give them a pass there. But otherwise, they prefer to attack Christians. "Why do you not understand what I am saying? It is because you cannot hear My word. "You are of your father the devil, and you want to do the desires of your father. He was a murderer from the beginning, and does not stand in the truth because there is no truth in him. Whenever he speaks a lie, he speaks from his own nature, for he is a liar and the father of lies." For we are a fragrance of Christ to God among those who are being saved and among those who are perishing; to the one an aroma from death to death, to the other an aroma from life to life. (2 Cor. 2:15-16 NAS) Get that? We stink to them. Indeed, all who desire to live godly in Christ Jesus will be persecuted. But evil men and impostors will proceed from bad to worse, deceiving and being deceived. It grates on me when atheists cry about having it rough. But there has never been widespread persecution of atheists, but boy, have atheists caused widespread persecution and murders of millions of of Jews and Christians. But note that it doesn't have to end with the lake of fire. If you're reading this, you still have a chance to repent of your sins and make the resurrected Jesus Christ the lord of your life. While there's still time. You may not have tomorrow, whether through sudden death, or the return of Jesus. Trust me, you do not want to be left behind! And a word to "religious" people: You're not going to make it. Religious rituals, intellectual assent, your "opinion" or "sincerity" — it's all worthless. You had better be certain of your salvation (2 Cor. 13.5). There will be quite a few religious people that are in for a rude surprise (Matt. 7.21-23). You, an atheist, someone that is complacent, an agnostic, a Muslim, a Satanist or anyone else can repent of (that is, turn from) your sins and make the risen Christ the lord of your life. Again, while there's still time. I've never been more serious.